Dissembled piety will be reckoned as double iniquity. You see, the Pharisees were also very zealous to convince people to follow what they believed. One could easily argue that they were sold out; believing with all of their heart that what they had faith in was true. None of that actually matters to God beloved. Only the truth does and the truth is that there is only one way to the Father and that is through Christ. Paul constantly warns us, as he does in the other key verse, that there will be false christs and false gospels. Henry's commentary, written over 300 years ago, seems remarkably prescient for the days we are living in. Once again, nothing new under the sun. Just as the Pharisees were not zealous for the glory of God or the good of the souls reached, so is the same with the purpose driven pastor. Sure in their heart they have deceived themselves into thinking it is all for God but even the language Warren teaches them reveals the truth. The unsaved are no longer to be called unsaved but rather, "unchurched." Think about that for a minute because it is not a small matter. The focus for the purpose driven pastor is not to save the lost but to church them. This is how you grow a church from 300 to 3000. By compromising the real Gospel, presenting goats with a false christ who cannot save them, and entertaining them enough that they are willing to come back each week. It is a business model. It is a leadership paradigm. This is why modern churchianity is obsessed with leadership conferences to learn more carnal tricks to bring more people into their pews. But it is not for the glory of God because they left Him out of it when they altered the Gospel. They made religion give way to their worldly interests. I say this as a backdrop to a recent article I read from church leadership profiteer, Carey Nieuwhof. The cheap shots Nieuwhof is referring to is anyone who wants to take an honest assessment of the teachings of these men. At the end of the day that is all the matters. I will stick to Noble in fairness to Wilson. Nieuwhof's foundational premise is flawed because he viewed Noble as part of the body of Christ when he is not. Perry Noble was a wolf devouring the sheep of the Lord. He once played Highway to Hell during worship. He is also the one that did the Miley Cyrus song mentioned earlier. He referred to those in his congregation who wanted to go deeper in the word as "jackasses" -- during a sermon. He has dropped the racially charged "N" word during a sermon. Last year he actually rewrote the Ten Commandments to make them more palatable for goats. He does not love Jesus Carey. The actual problem is it is quite plain he does not know Jesus. I believe Nieuwhof when he says that Perry Noble wanted to reach people with his beliefs but so did the Pharisees. It does no good to only then make them twice the son of hell that you are. I am sorry Carey but they did not get in this for the right reasons. They may have thought they did, but they were taught so poorly by people like you that they simply did not know better. Nieuwhof then offers up three thoughts about these two recent exits from ministry. Keep in mind that he goes out of his way to not address that while Wilson resigned of his own accord, Noble was essentially forced out for refusing to deal with an alcohol abuse issue. Each of these three thoughts reveals the flaws inherent in the teachings the pastors of today adhere to through the Purpose Driven Church model and leadership experts like Carey Nieuwhof. In debating circles this is what is known as a strawman argument. I do not recall ever hearing this type of criticism because someone leaves the pulpit. In the vast majority of instances, there is a reason why the pastor has left and that is usually what is called into question. At least Pete Wilson was honest enough to walk away but most do not until they have fallen from grace. Perry Noble, Tullian Tchividjian, Bob Coy. The names litter the news feed and nearly every time there is a moral failing associated with the exit. Perhaps that is why people level the accusations of "fake." When you preach about morality and then fall morally, the damage done is twice as bad. But what is revealed here about the purpose driven paradigm is that it protects the wolf at all costs. The sheep are never considered. The damage done to sheep is never discussed. It is always about how hard a job the pastor had and any fair discussion of doctrine, leadership or the failing is summarily dismissed as "taking cheap shots." 2. It's hard to lead anything. Leaders face pressures non-leaders don't always understand. And leaders of large organizations face even more complex problems. When you lead a large ministry or organization, it comes with problems and challenges 99% of the population never wakes up to most days. Add to that the pressures of life, marriage, family, relationships and the task of leading yourself, and you have a recipe that requires tremendous personal stamina, humility, growth and development. -- Carey Nieuwhof What is revealed here in the purpose driven paradigm is the lofting up of the leader over the people. Yes it is true that not everyone is called to divide the word of truth and that pastors and teachers will be judged on a stricter standard. That does not mean however that they get a pass because they chose a difficult job. But what is being baked into the cake here is a built in excuse when the person falls. Well, they are under a lot of stress and you just simply cannot understand. How much of that stress however is actually caused by the carnal demands of leadership they impose upon themselves? The yoke of Christ is actually easy and light. If one stays true to the Gospel, God does the heavy lifting. Herein is a fundamental underpinning of their poor understanding of the Bible. 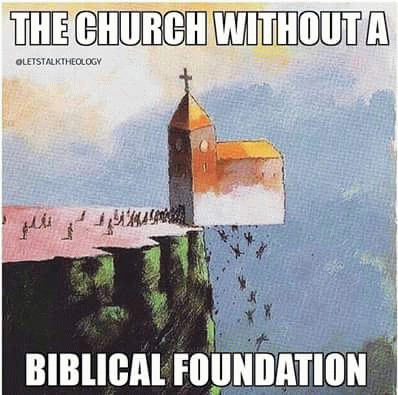 God is responsible for the horizontal growth of His church. The pastor being a shepherd, is responsible for the vertical growth of the sheep God entrusts to him. And day by day, attending the temple together and breaking bread in their homes, they received their food with glad and generous hearts, praising God and having favor with all the people. And the Lord added to their number day by day those who were being saved. -- Acts 2: 46-47 (ESV) Who adds to the number being saved? God does. But in the purpose driven leadership schema, this becomes the responsibility for the vision casting CEO pastor-dude. Well, no wonder there are so many burning out across the Christian landscape! When we trying to take on the responsibilities of God I can guarantee that it will not end well for us.